Have you ever heard of spoon hamburger? That is one of the things we had today at a family gathering at my in-laws' house. 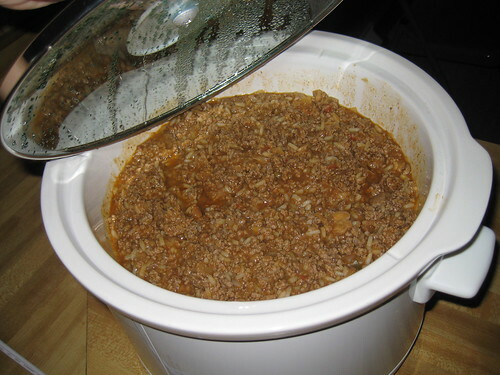 Here is a recipe for it from Cooks.com They call it spoon burgers though and my mother-in-law doesn't use hot fat in it. Brown beef in hot fat in 10 inch skillet over direct low heat. Add onion to meat and cook until onion is nicely browned, about 5 minutes. Stir remaining ingredients into above. Cover skillet and simmer over direct heat 30 minutes. 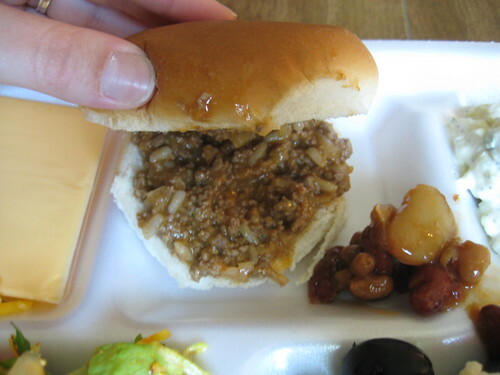 Spoon on hamburger buns. 8 spoon burgers. My mother-in-law explained that she started making this because my husband and his sister don't like barbecue sauce or the flavor of sloppy joes. 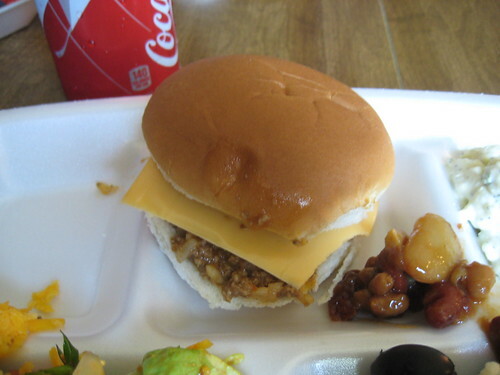 I grew up eating sloppy joes with kraft american cheese. I had never had anything like, nor had heard of spoon burger/hamburger until I met my husband's family. My ex-fiance's family used to eat raw beef (the highest quality they could find) with vidalia onions at Christmas and other holidays. They would get so excited when they had raw beef and I was so disgusted. Does your family make anything really different at their family gatherings? Our tradition is German Potato Salad. I love it and some of my sister-in-laws dislike it or just get sick of having it at family gatherings. 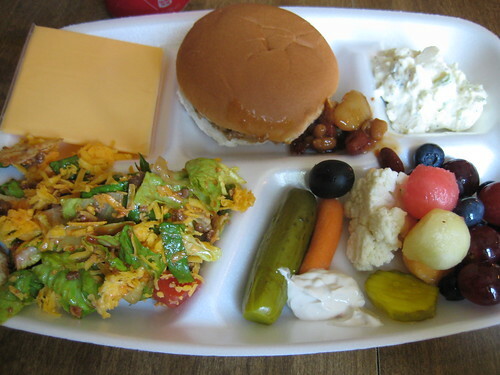 Here is my plate...taco salad, fruit, veggies, potato salad, spoon hamburger. 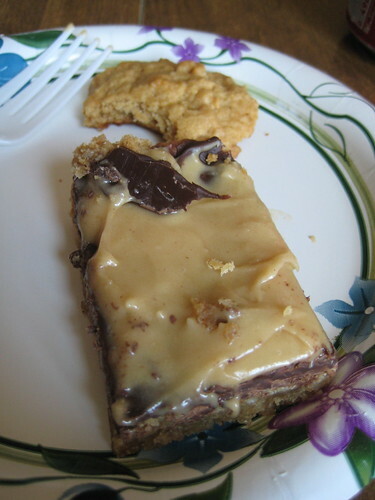 Dessert was a peanut butter chocolate bar and a pb cookie. I had to relearn who was related to who at the party today because we only see these people once a year (they are my father-in-law's cousins). 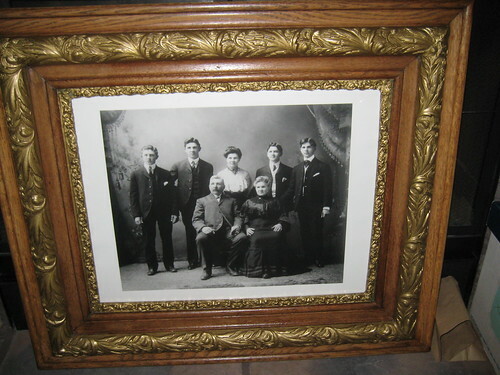 We talked about the German ancestors in this picture and who was who in it. The guy on the left is my husband's great grandfather. This morning, I went to the gym and rowed, walked at a high incline on the treadmill, and lifted weights. I was so hungry when I got home and immediately knew what I wanted to make. 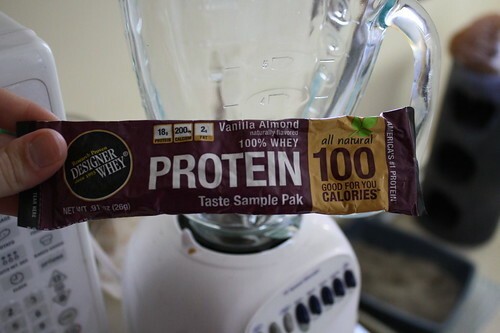 I didn't want a very filling smoothie, so I used this whey protein powder I got a sample of from a drugstore.com order. 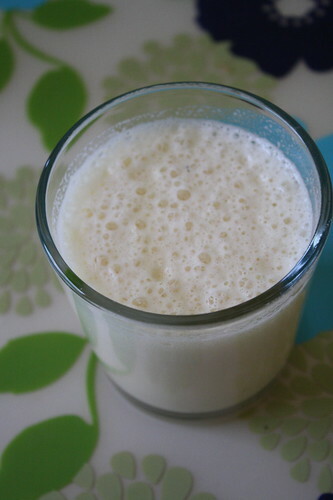 I mixed it with skim milk and it was delicious! 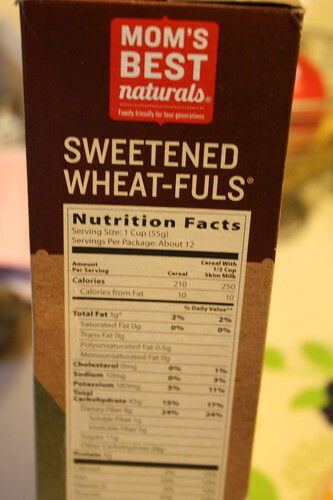 I would definitely buy a big container of this if I could find it in the store. Whenever I work out in the morning, I notice that I am so hungry! 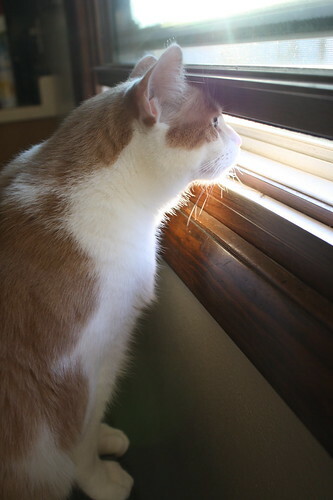 I wanted to eat everything in sight when I got home. I need to sign off so I can call my sister who turned 50 today and wish her a happy birthday. I'm off to my in-laws' house today for a family party, so I thought I would recap Saturday before the busy day begins. I still have to get in my workout, shower, and then we need to be at my in-laws' house by about 12. 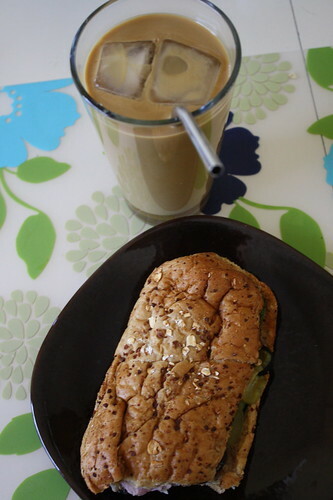 For lunch yesterday, I had a 6 inch Subway ham and cheese sandwich and a Godiva Iced Vanilla Bean coffee. I received the Godiva coffee from the Foodbuzz Tastemaker program and I'll do another separate post on the coffee soon. 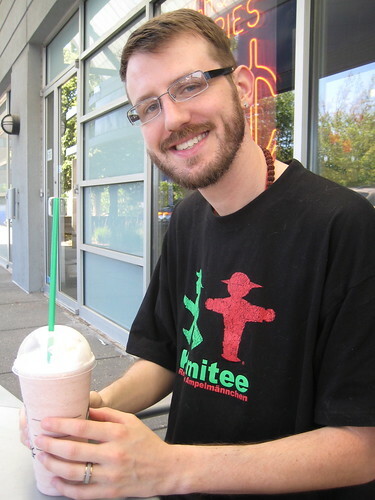 We headed out of the house to get Craig's free birthday drink at Starbucks. 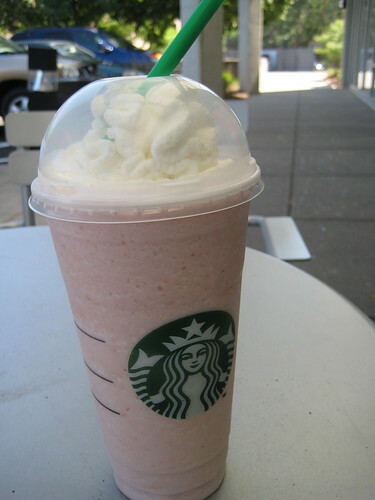 Since he doesn't like coffee, we got a Venti Strawberries N' Creme. 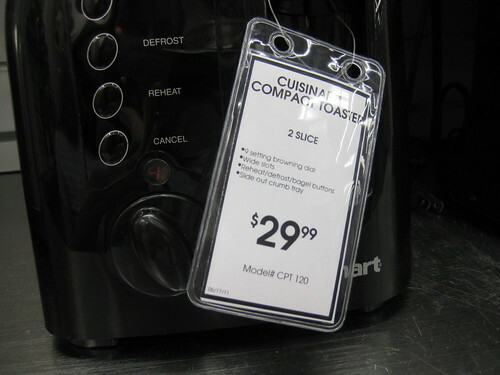 While at Bed Bath and Beyond, I was beginning to think that we'd never find a toaster that had good reviews or wasn't cheaply made. I liked the look and durability of this one, but Craig scanned in the barcode on his phone and found it didn't have great reviews on Amazon. Enough ranting about toasters. We didn't buy one and may just have to go with the Kitchen Aid one that is rated best on Amazon. The rest of the night, I just relaxed, made a very late and random dinner, then did dishes and put laundry away since I knew I wouldn't have much time for it today. 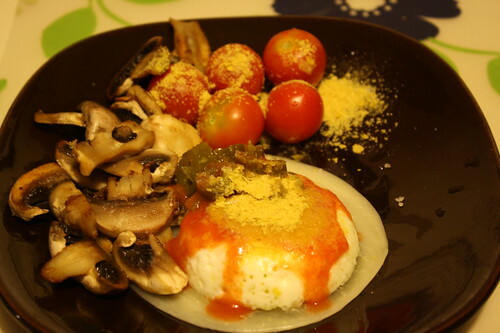 Dinner was a poached egg, provolone cheese, mushrooms, jalapenos, Frank's Red Hot sauce, tomatoes, and I put Nutritional Yeast on top of the egg and tomatoes. I really couldn't taste the yeast. 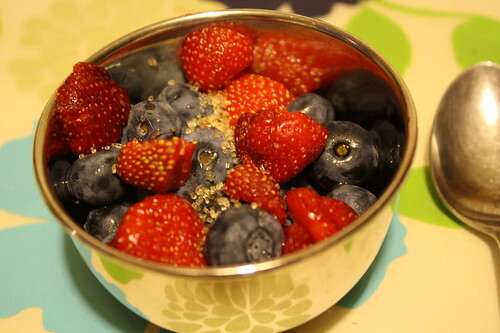 Dessert was nice and healthy--strawberries from our garden & blueberries, topped with some raw sugar. I'll be back tonight with a post about weird things and strangely named things families eat. One of the things we are having at the party today is not weird, but has a strange name that I had never heard of until I met my husband. Hearing the name cracks me up every time! 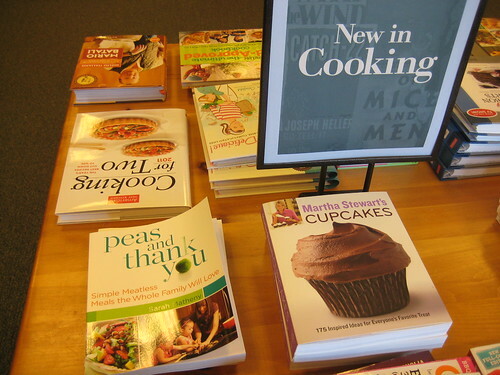 Does your family eat anything particularly odd at parties or call certain recipes weird names? Do you ever have those weeks where you just feel too tired to do anything, especially after a long day at work? Yeah, that was my week. I have been feeling tired, but also just not motivated to fit blogging into my schedule. I have to remind myself to just go with it when I feel the need to just unplug and read books, workout, and relax in general after work. Here's what I have been eating, doing, etc. this week. My meals weren't really that interesting, except for when I ate out with Karis on Thursday. 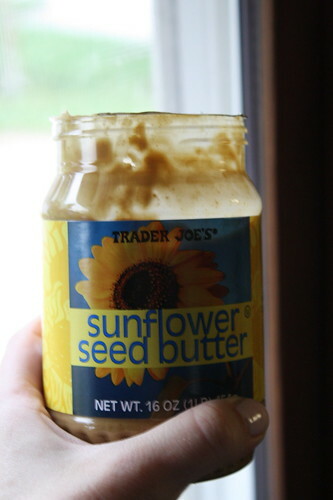 I did try Trader Joe's Sunflower Seed Butter for the first time! It had been sitting in our cabinet for about a month, so I decided to open the jar up and just dig in. 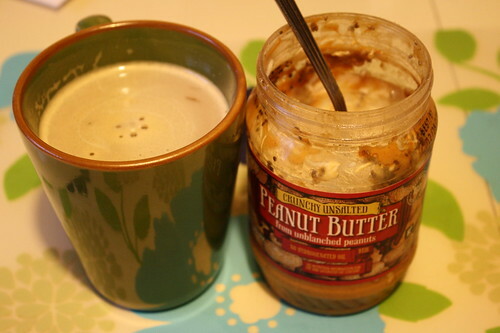 I liked it, but maybe not as much as peanut butter. It is very creamy, so I think it would be wonderful on hot oats. I don't really love overnight oats in a jar (I prefer hot oats), but it is a convenient and healthy breakfast for when I feel rushed in the morning. I had a Trader Joe's unsalted peanut butter jar that had just about an inch of pb left in it, so I went with making OIAJ. 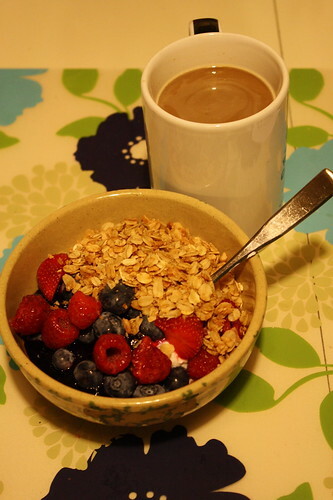 I added skim milk, chia seeds, and some Brown Cow maple yogurt. 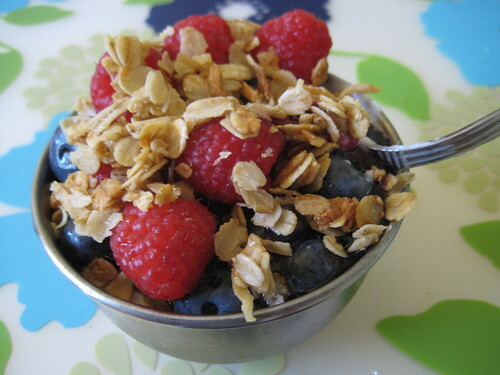 I had lots of plain chobani with blueberry preserves, fresh fruit, and granola this week. 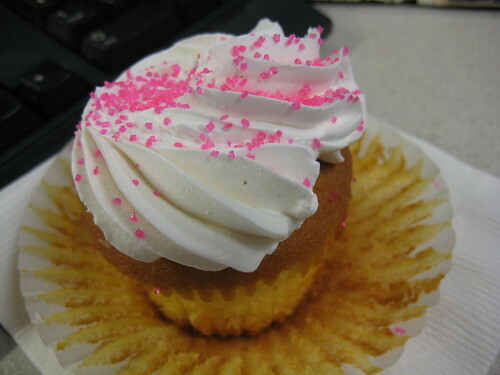 Indulged in a yummy cupcake at work. The frosting on this was perfect--not too sweet and sickening! 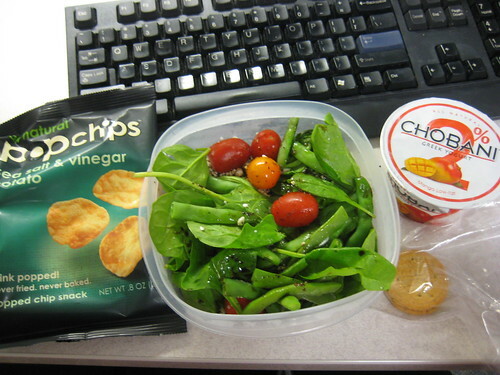 Lunch on Thursday--a big salad, mango Chobani, and I tried Pop Chips for the first time! They tasted great! I had the sea salt and vinegar. 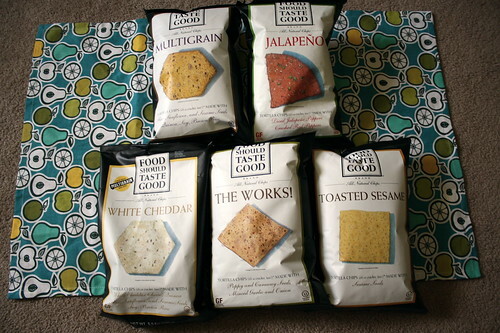 Thanks to Pop Chips for sending me some chips to try out! Can't wait to try the other flavors now. 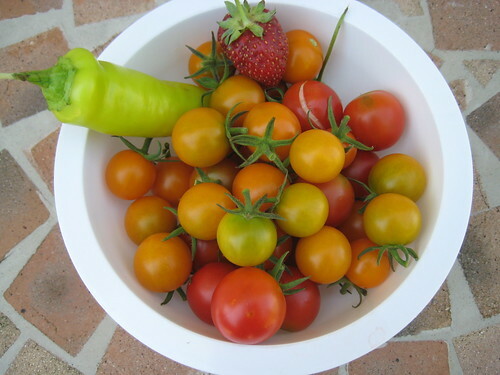 Our garden is producing more tomatoes now! The romas still don't look great, but the cherry tomatoes keep on coming and I love having them around for salads or snacking in general. We also have been getting more strawberries--some big and some tiny and ripe. 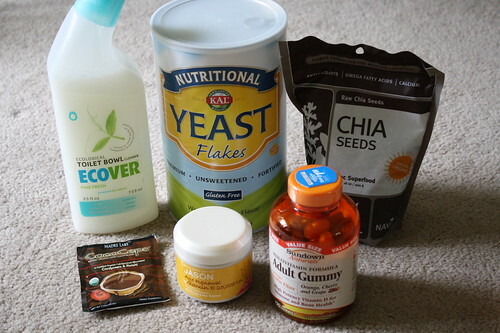 I ordered these items from iHerb. I have never tried Nutritional Yeast, so I hope I like it. 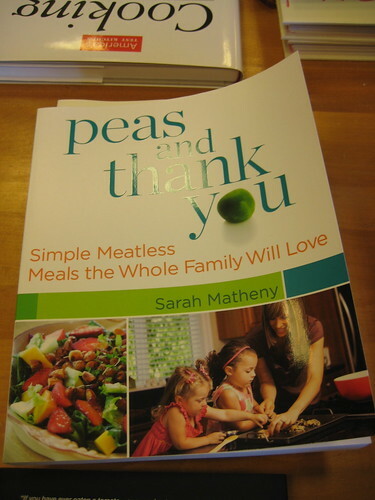 I plan to make some of Mama Pea's Mmmm sauce with it this weekend. Averie had a coupon for iHerb on her blog, so I got $5 off my order and free shipping! 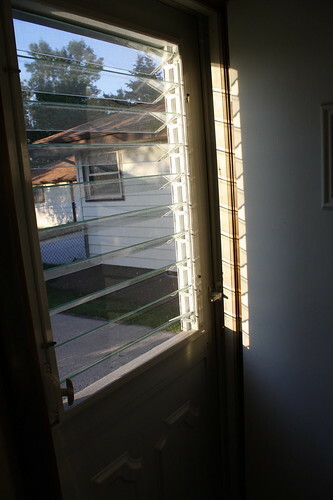 We enjoyed having the windows open for only a couple of hours one cool evening. 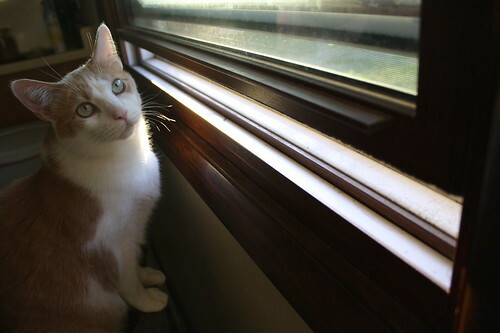 I miss fresh, cool air flowing through our house. Karma enjoyed the fresh air too! 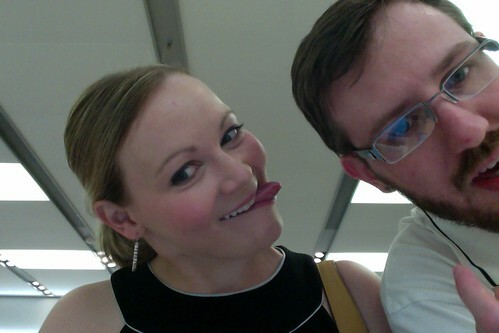 Now we're off to get Craig's free Starbucks drink (b-day coupon) and maybe look around at toasters. Ours has been funky for a while, but we both aren't satisfied with the reviews we find on Amazon of most of the models out there. 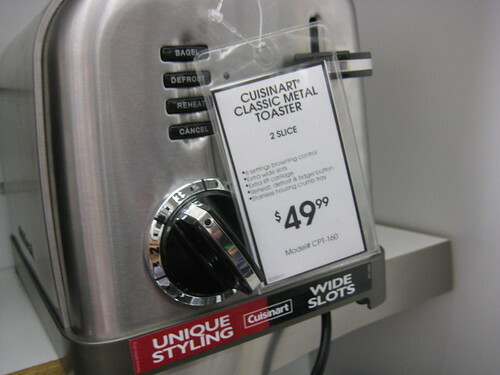 Anyone have a toaster model they recommend? 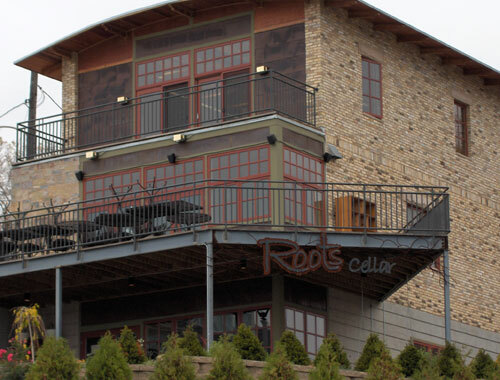 Last night, Karis and I went to Roots Cellar. 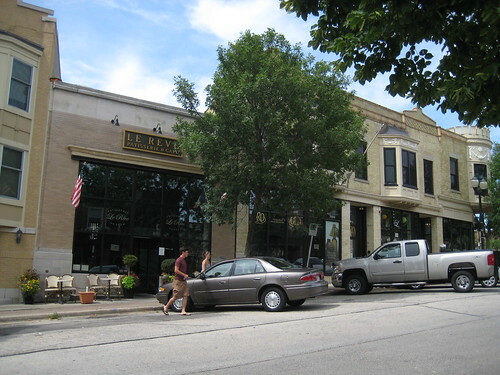 "As many of our vegetables as possible are grown in Wisconsin, many of which are from our own farm in Cedarburg. 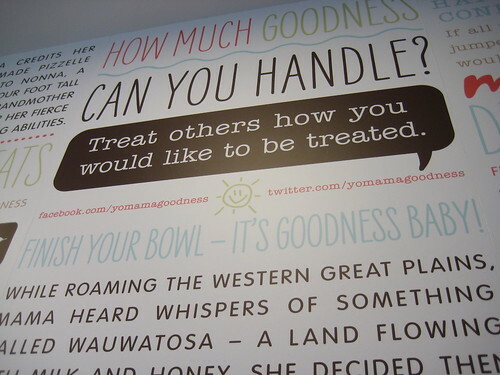 As Wisconsin’s only farmer-chef owned restaurant, we are proud to support as many local farmers as possible." We ate inside, which was cozy and still offered a pretty good view of Milwaukee all lit up at night. The patio looked nice too. 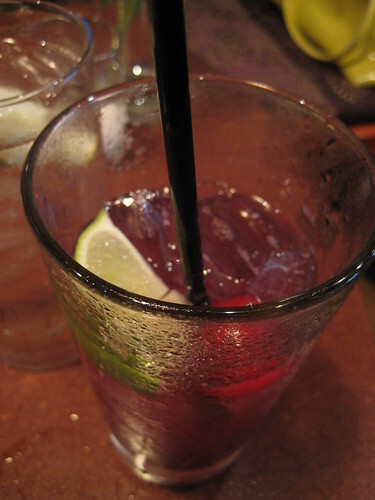 I started out with some sangria. We shared a Artisan Cheese Plate, which was complimentary, as long as you went on a Thursday night and spent $25 on your meal and drinks. We mentioned Bluprint to get the deal. 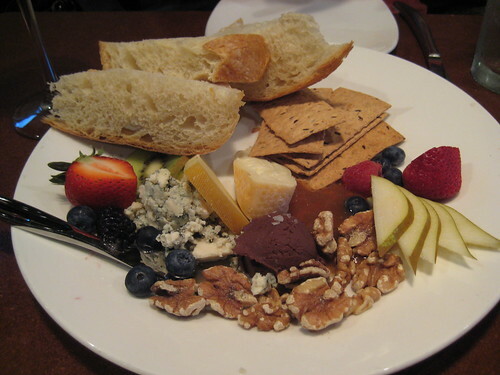 The cheeses were delicious and I especially liked the chocolate truffle! 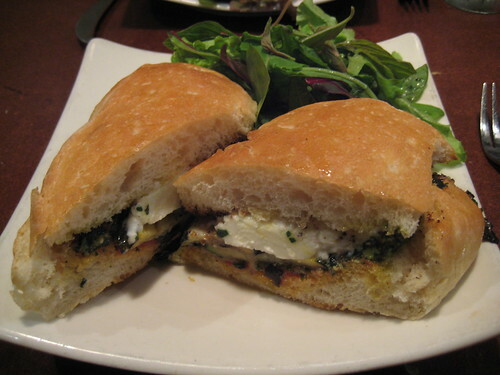 I ordered the Grilled Squash & Eggplant sandwich which had fresh milk mozzarella, basil pesto and tomato jam on top. It was quite the tasty sandwich! I had such a good time talking to Karis & eating good food last night! Winner of Food Should Taste Good Chips! 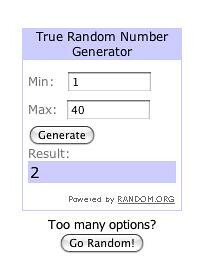 The winner is....(hint: a fellow Wisconsin girl who is now living in Michigan). 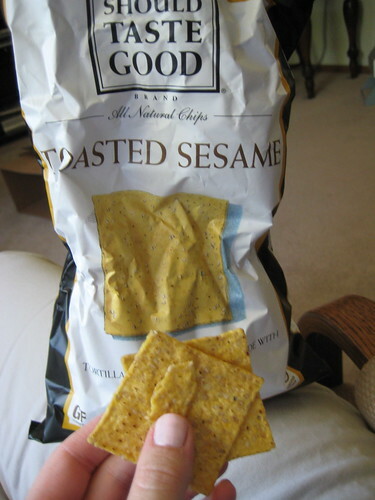 Please send me your mailing address and the five chip flavors you would like to try and I'll send your info to the folks at Food Should Taste Good! I am sure most of you have heard about the awesome fundraiser Janetha at meals & moves put together for Susan. I did bid on a few things, but didn't win anything and couldn't keep up with the bids while at work. I was just following the twitter stream on the Great Fundraising Act and saw that they are nearly up to $25,000 raised! That is so wonderful! I am so happy to be a part of this supportive and giving community. Now Susan can hopefully cover the cost of her meds down the road so she can bravely battle cancer. 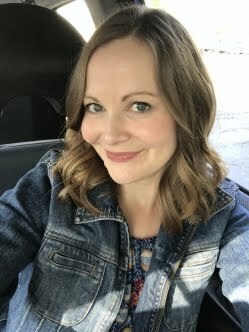 I just started reading Susan's blog about a month ago and I have teared up a couple of times reading her posts. She writes so beautifully and honestly. 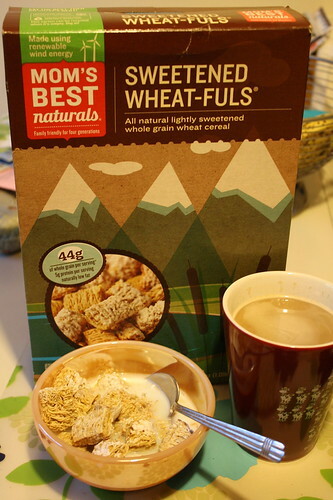 Breakfast was Mom's Best Naturals cereal. 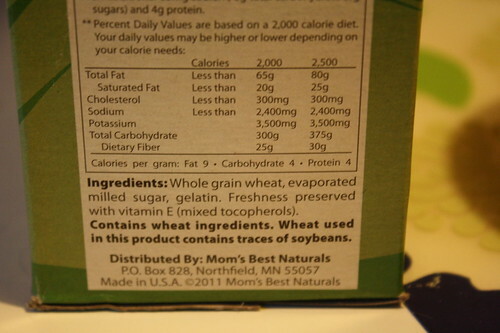 The ingredients aren't too bad. I found it at our local grocery store, Pick N' Save, and had never seen the brand before. I didn't take a picture of my lunch, but I had a big spinach salad with warmed up tofu, grape tomatoes, green peppers and feta. Yeah, basically what I had yesterday without the mushrooms. I was so full, that all I could eat after that was two Back to Nature peanut butter creme cookies. And dinner will look familiar because it's what I had last night (except for the cooked green beans). 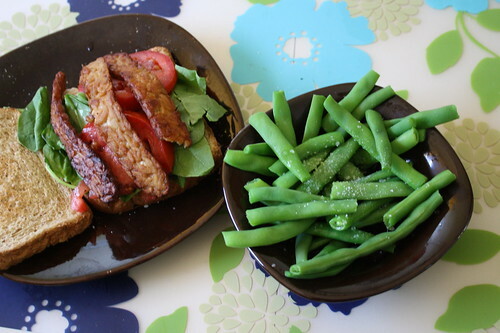 That's right, the tempeh spinach tomato sandwich will probably be one that keeps appearing on my blog because it's so good that I can't get enough of it. I cooked up some green beans from our garden and made them the way my cooking teacher did in class last week. I boiled the water, threw them in for about three minutes, put some olive oil and sea salt on top and they were perfect! Craig tried one and didn't even mind that they weren't as cooked as he likes his. He looked like he said "thannk you verrrry much" with his lip curled up. Too bad I couldn't snap a pic fast enough to capture it! 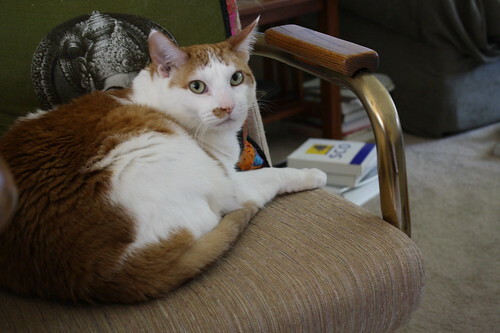 Karma was up to his weird antics sitting on the top of the recliner. It drives Craig nuts (and makes him slouch), but we still think it's cute. I have seen pictures of other cats doing this, but this is a recent thing for Karma. 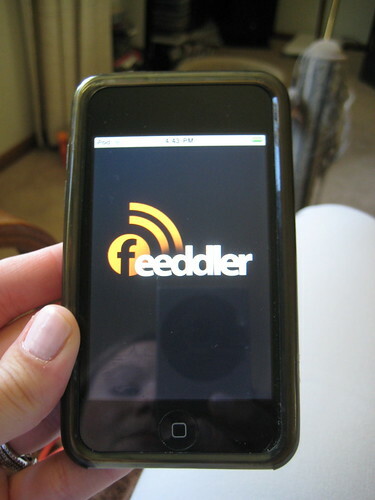 I've been keeping up with reading blogs by using this iPod/phone app called Feeddler. 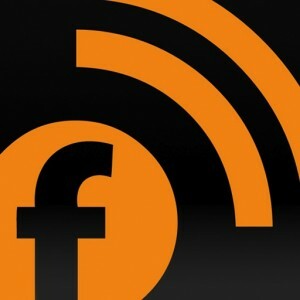 It's like Google Reader but better. When I am on a computer, I still enjoy using Google Reader. 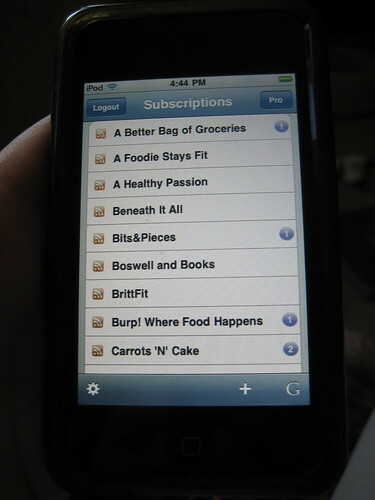 Reading blogs on my iPod through the Google app just wasn't cutting it anymore. And to end this lengthy post--my workout today included a 25 minute walk on the treadmill while watching HGTV. I lifted some weights and used the Freemotion machines tonight in addition to the normal machines I usually use. I could really feel the Freemotion working my arm muscles! Can't believe the weekend is almost over! Where did it go? 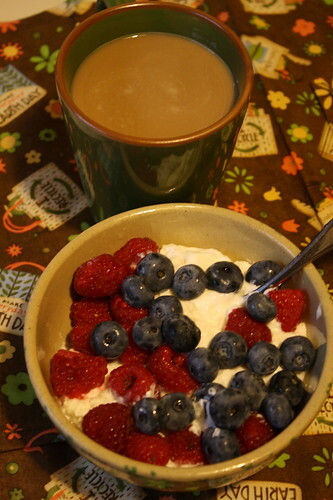 Breakfast was non-fat plain Chobani with raspberries and blueberries. It was a little too bland for me, so I added some Bonne Maman jam too. Is it just me or does Chobani seem thicker than it used to be? I was so full after this big bowl! 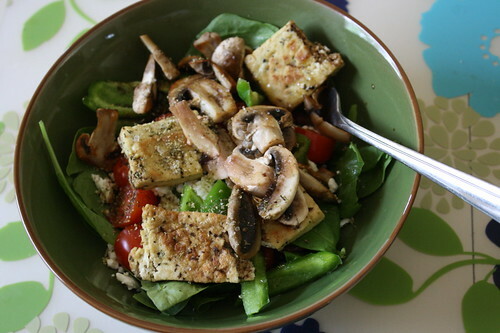 Lunch was a spinach salad with mushrooms, grape tomatoes, herbed tofu, and feta cheese. Then it was time for us to head out of the house. We took a drive by the house that my sister-in-law bought last week! It was cute and in a nice area. I'm excited to see the inside now. 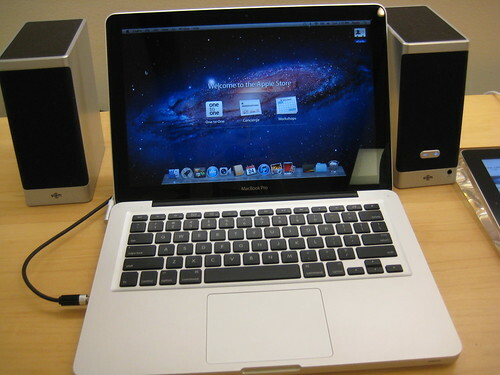 After that, we went to Mayfair Mall to check out the laptops. 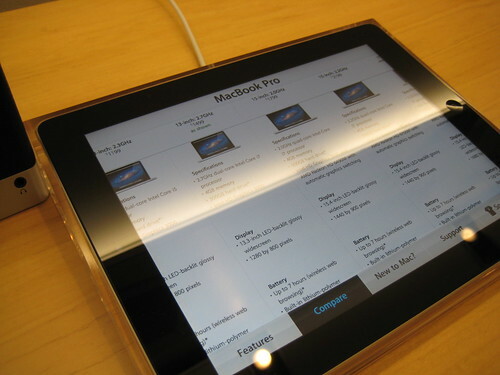 I'll definitely be getting one of these very soon. 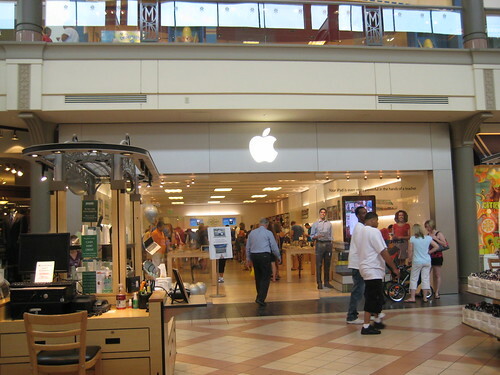 The reason that I didn't buy it today was because I want to clean some items off of my current iBook a bit more before having the Apple store transfer items to the new computer. 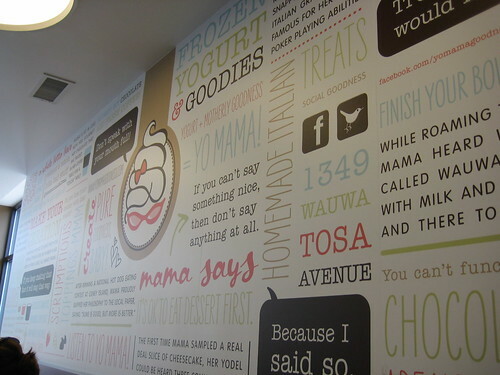 Then it was ice cream/frozen yogurt time in Wauwatosa! 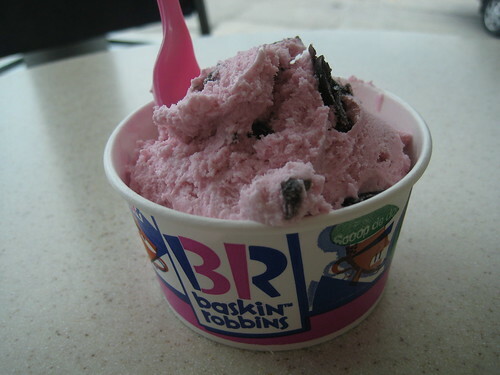 Craig and I are signed up to get a free scoop of ice cream from Baskin Robbins for our birthdays. He picked out cherry and it was tasty! 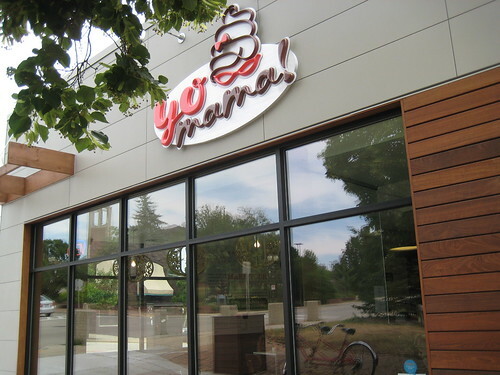 Right near Baskin Robbins, there is a new frozen yogurt place! It just opened in June of this year. 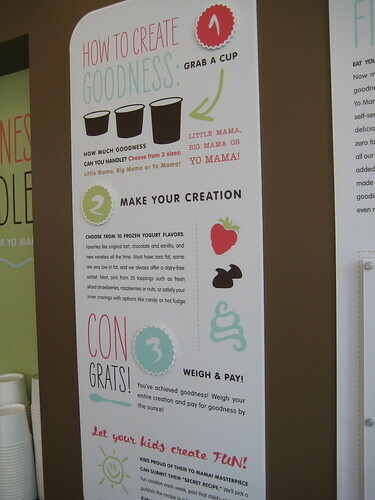 After becoming a bit obsessed with frozen yogurt in Florida, we longed to have a place like Menchie's or Pinkberry in Wisconsin. 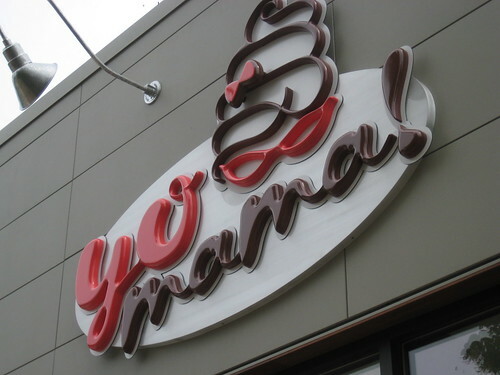 We finally have it with Yo Mama! Craig always goes for the fruity combinations and I go for chocolate, caramel, etc. 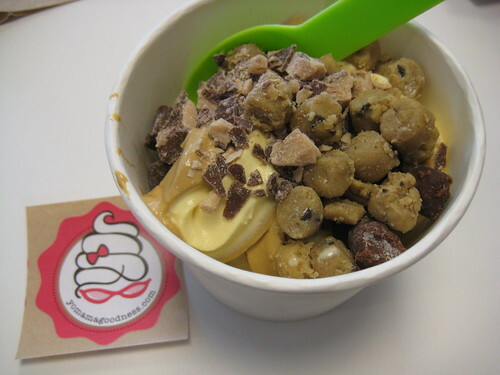 Today, I chose Dulce de Leche and Cake Batter swirl. I topped it with heath bar crumble, brownie bites, & cookie dough. Fantastic combination! Our total for two came to $8.31, which this numbers freak got excited about because my birthday is 8/31 and I love when it pops up unexpectedly at a cash register like that. I know, I am a dork. 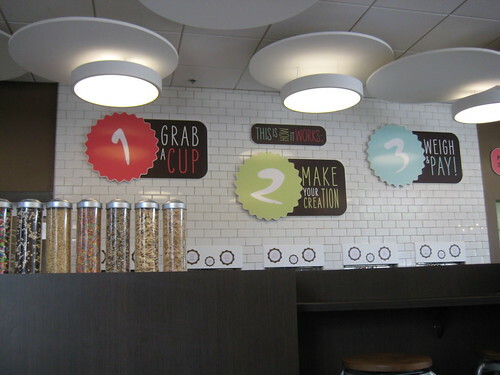 The yogurts were 45 cents per ounce. 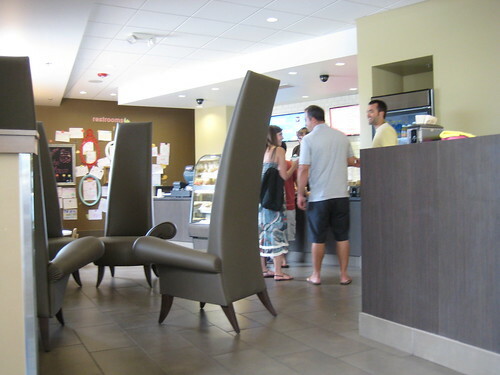 The interior is cute and reminded us of Menchie's in Orlando, Florida. 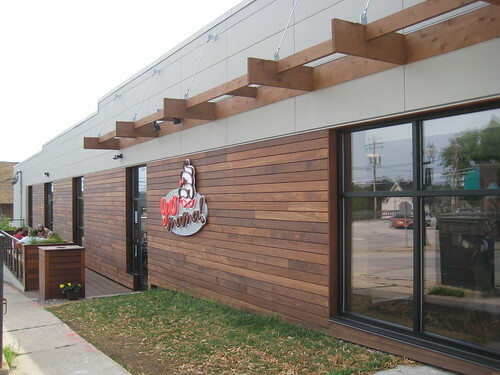 Love the wood on the exterior. We walked down the street and I was reminded that I still need to check out the French Cafe Le Reve and the olive oil place next door sometime. What a great afternoon with Craig! I needed to burn off some of the frozen yogurt, so after a little cat nap with Karma sprawled out on my lap, I hit the gym. I biked for 25 minutes (my ankle is not in tip top shape again, so biking is mainly what I have been doing lately) and lifted weights. I even went to the "men's weight" area and used the barbells in there to do some Body Pump moves. I was so proud that I broke through my fear of going in that area. Now I'll never be scared again (I hope). This is so wrong, but while I meditated, I started craving a BLT. 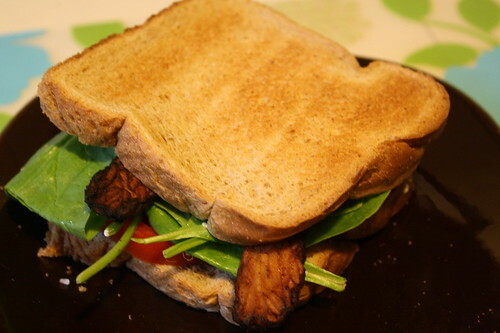 Well, we didn't have any bacon, so I was imagining a tempeh BLT sandwich and that's what I made! 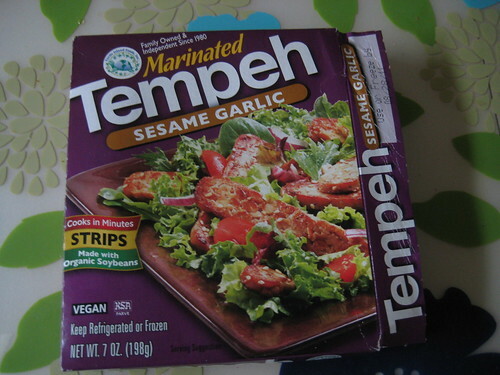 Like frozen yogurt, tempeh reminds me of Florida because the first and only other time I tried it was while we were there in February. 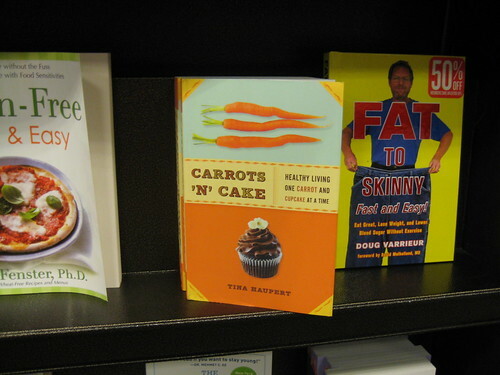 I had it in my Whole Foods salad bar creation and I liked it then. I cooked it up on the stove and topped it with spinach, mayo, and roma tomatoes. Time to go watch a movie, since I have been half ignoring it and half paying attention. 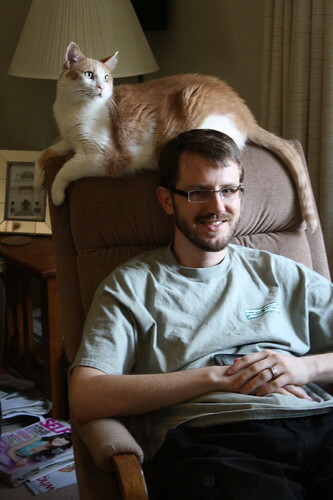 Happy 31st Birthday to my husband Craig! B.I.C. bands giveaway ends today! B.I.C. Bands Review and GIVEAWAY! "Mother Nature is Trying to Kill Us!"